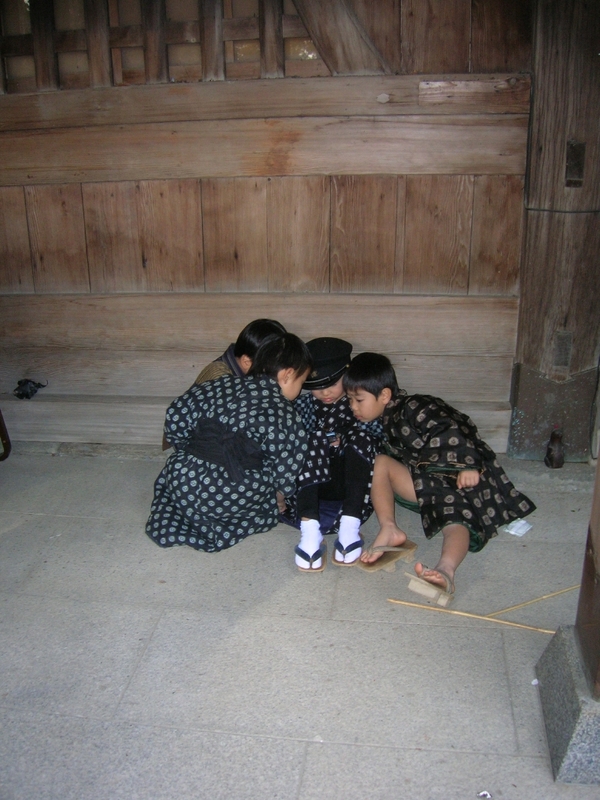 This picture of kids I encountered in Japan in 2004 playing with a game-boy exemplify one of the most intriguing feature I observe in gaming: a situation where only one person has a game device and the others are participating without it, in their own way. This is a common situation in gaming, one can also observe it on game consoles (where one person plays with the pad and the other helps in a less formal way). In their paper presented at CHI 2008 "Renegade Gaming: Practices Surrounding Social Use of the Nintendo DS Handheld Gaming System", Christine Szentgyorgyi, Michael Terry & Edward Lank describes an interesting exploration of the social practices related with a mobile game platform. Unlike my picture above, they investigated players who had their own mobile consoles. Based on a qualitative study, the authors studied how players engage in multiplayer games via ad-hoc, wireless networking and how it affects the social gaming practices.
" renegade gaming, or the notion that users reappropriate contexts traditionally hostile to game play; pragmatic and social barriers to the formation of ad-hoc pick-up games, despite a clear desire for multiplayer, collocated gaming; and private gaming spheres, or the observation that the handheld device’s form factor creates individual, privatized gaming contexts within larger social contexts." "we focus on two particularly salient design implications suggested by the data, namely better support for ad-hoc, pick-up gaming, and mechanisms to expand the social gaming experience (...) Mechanisms that allow one to more easily locate other local DS gamers, invite a player to a multiplayer game via the DS itself, join preexisting games, and gracefully exit games would all help address the desire for pick-up games. The implementation of these suggestions is certainly technically feasible for a system such as the DS (...) To help create a broader social context, the system could provide provisions to externally display game state on a shared display so non-players could observe game action. " Why do I blog this? gathering material for a potential project about social gaming practices for a client. This is quite an exciting topic and I am try to collect some material about it in the context of mobile games. I am quite sure that lessons can be learned from the Nintendo DS and that it would be possible to transfer them into a cell-phone context. Manhole covers from the 21st century? How to define a "failure"